One pillow case --- I used a standard size pillow case but any size will do. Your favorite stuffing --- I prefer to use polyester fiberfill because of it's squishy-ness. Sewing supplies --- sewing machine, thread, pins, scissors, pinking shears. Pencil or maker and something round (plate, bowl or cardboard circle cut out). 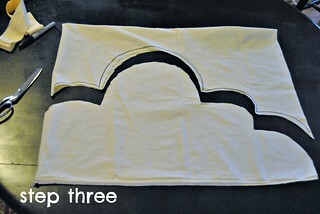 Iron your pillow case and turn it inside out. 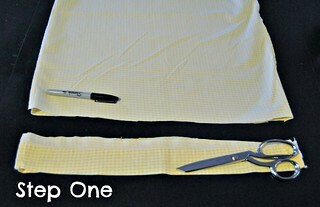 Then trim off the hemmed edge of the pillow case. 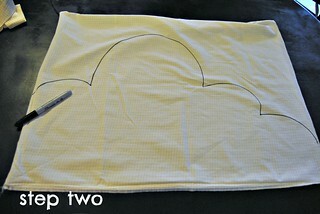 Use something round (a plate, bowl or cardboard circle cut out works well) to draw the cloud 'humps'. Or, if your comfortable doing so, draw the cloud freehand. Cut off excess fabric. (if you used a sharpie like I did cut just below your drawn line) Pin all around and get ready to stitch. Because your using a pillow case, you'll have two sides that are already seamed. That means half of the the work is already done for you -- yay! 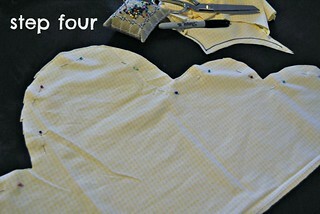 Start stitching around the cut and pinned edge. Don't forget to back stitch in the beginning and end. Go slowly around the curves and in the corners stop with your needle down, lift your presser foot, pivot, lower your presser foot and continue sewing. Stop before you get to the end, leaving a space big enough for your hand to fit for turning and stuffing, and back stitch. 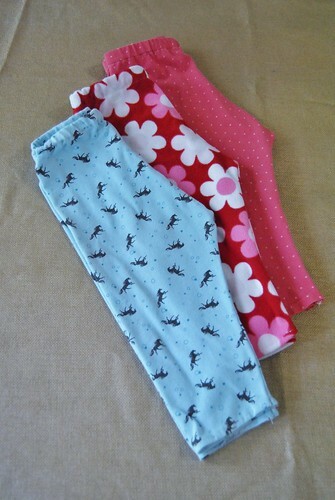 Trim the seam allowance with pinking shears then turn the pillow case right side out. 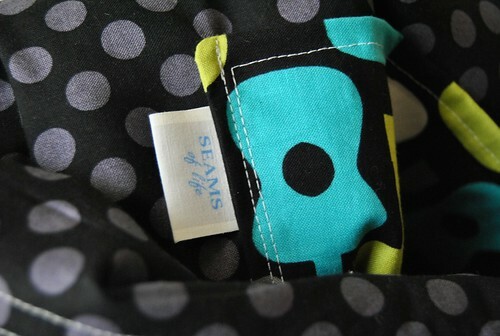 Stuff your pillow and then close the opening by hand-stitching or machine stitching. 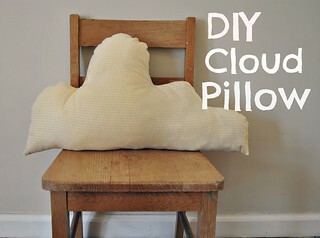 Hope you enjoy your new cloud pillow -- make a whole sky-full! I'd love to see the ones you make. Please leave me a link in the comments. And, if anything is unclear in my instructions, please let me know. 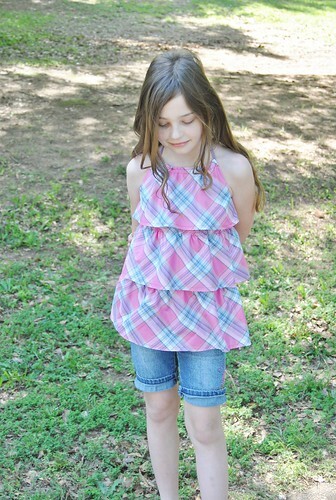 I'm still on a 'kid's clothes' sewing kick after seeing all the amazing things made for last week's KCWC. 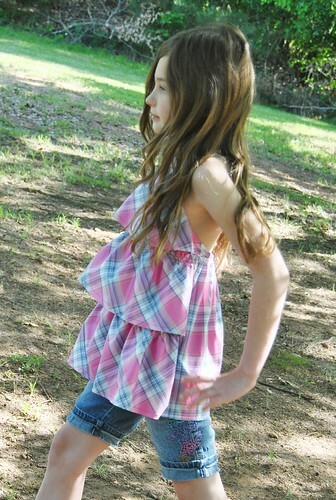 I upcycled some of my big girl's old shirts into leggings for Molly. 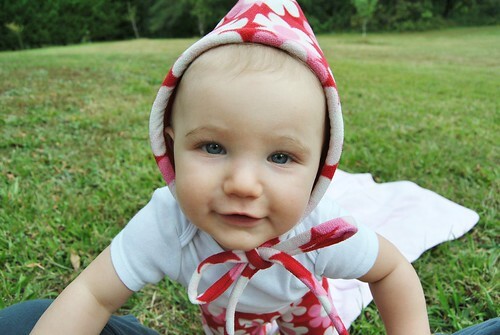 And just for the shear cuteness of it, I made a Snow Pixie Hat with leftover scraps. Making pants has become second nature to me but making tops intimidates the heck out me. This week I have been working hard to overcome that intimidation. 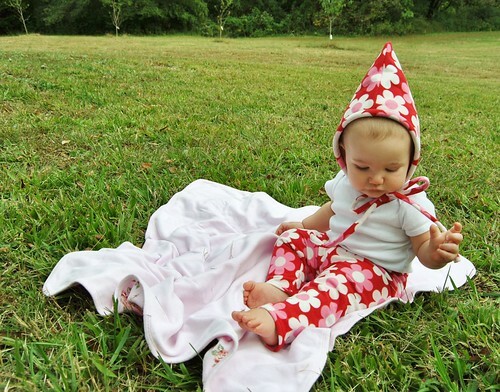 With Dana's helpful instruction, I've been working on drafting a pattern to make a top to go with those sweet leggings. So far I've had two failed attempts but I'm not giving up yet. 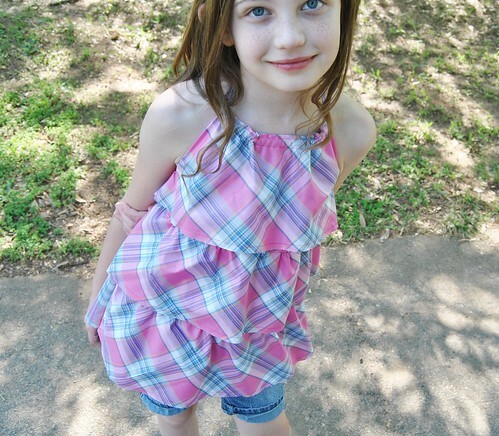 Hope to show you a well-fitting top on Miss Molly soon! I haven't accomplished as much as I had planned for this season's KCWC -- you know how these things go. 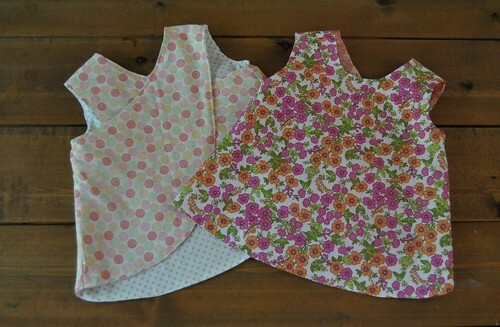 I did, however, manage to finish up these Criss-Cross Tunics from Whimsy Couture that I began sewing over the summer. 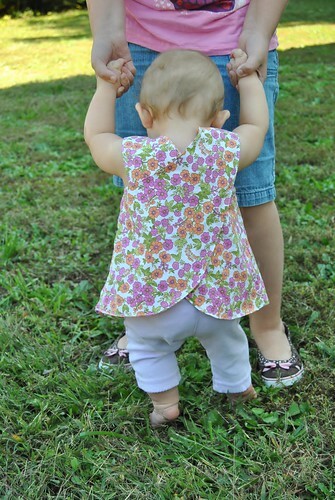 It's a shame that the weather here has turned chilly but I think they'd be just as cute over a long-sleeved shirt. 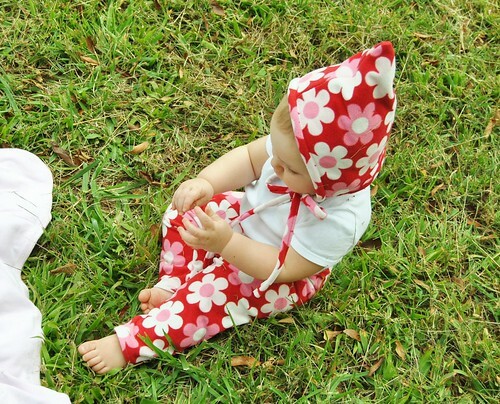 And it's a possibility that they'll still fit Miss Molly come Spring. I hate that I broke my blogging streak last week. I was on a roll there for a while posting at least twice a week...that's so not me but I enjoyed it. Hopefully I can muster up some more blogging momentum because I have several things waiting in the wings to show here. This is the last week (and the busiest week) of school. There are lots of field days, award ceremonies and general excitement for the upcoming summer going on here. I'm pretty excited for the summer to start too. Last summer wasn't so great for me since I was in the first trimester of my pregnancy, nauseous, hot and moody. 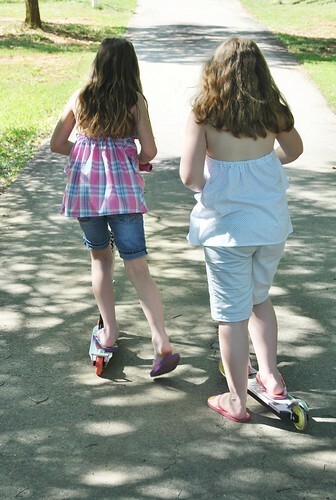 I plan to make that up to my kids and have a joyful summer together. 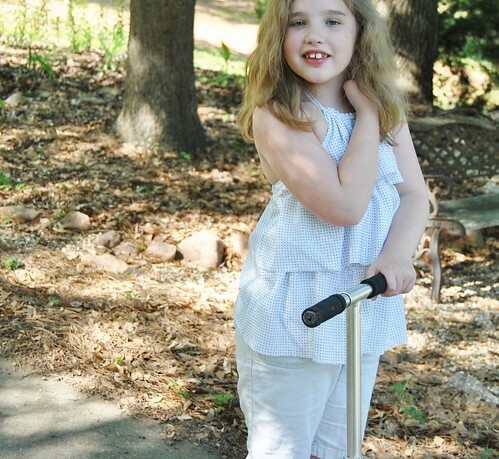 My daughter Sarah loves to help in the kitchen, especially if we're baking something sweet. To be honest, I'm usually too controlling to let her do much more than crack eggs, much to her dismay. 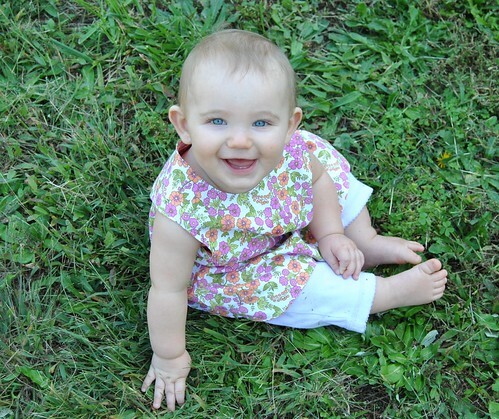 This weekend I decided it was time to let go of that control and let her do it all. 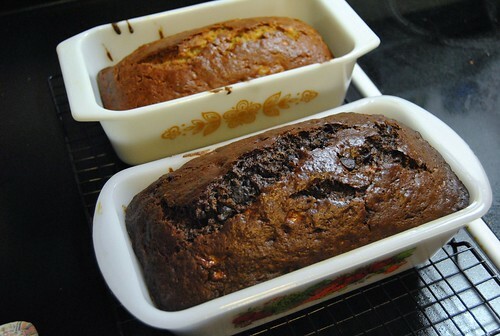 She made two loaves of banana bread -- one plain and one chocolate -- and they were delicious! Last week I finally finished a project that's been sitting next to my sewing machine for way too long. 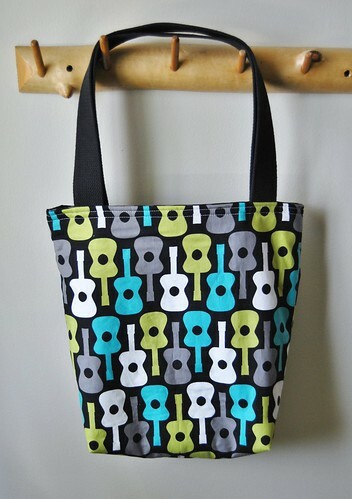 Way back in January, before Molly was born, I made my neice a bag with Michael Miller's Groovy Guitar fabric (purchased from Hypernoodle Fabrics). She loved the bag and I promised to make her a smaller one with the remaining fabric I had. Almost five months later, I finally did. This was just a simple tote -- lined and with a pocket on the inside. I've made so many in the past that I don't have a tutorial or pattern to share. Hmmm...maybe I should write one. It's been done so many times on so many blogs but it would be nice to have one on my blog if only for my own referencing. No sewing happened on day 4 of KCWC. On day 5 I decided to nix the dresses on my list and make ruffled halters instead. 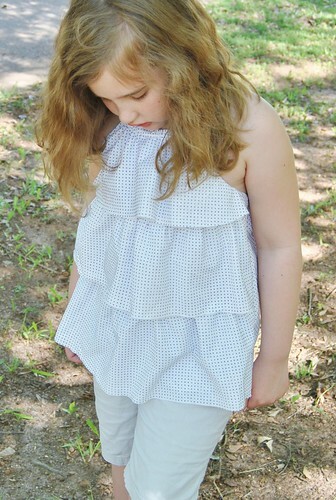 I used the free pattern available on Oliver+S' website. 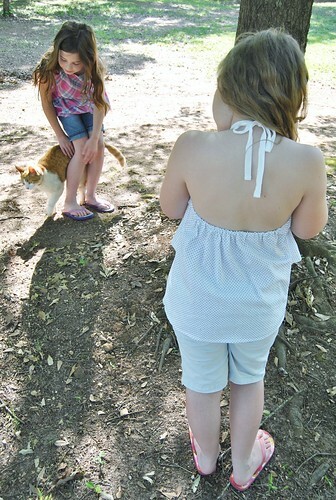 Days 6 and 7 were spent sewing up these tops and they were a big hit with my big girls. They were literally sitting by the sewing machine waiting for me to finish and then they both were eager to a little blog photo shoot. Their excitement was so refreshing. These big girls of mine aren't usually so easy to please. And with that another KCWC has ended. I didn't make a lot (2 sleepsacks and 2 halter tops) but what I made will be well worn. It was so much fun though and, as always, inspiring. Much thanks to Elsie Marley for hosting and I look forward to the next KCWC.